- This is a small footstone. The stone is upright and firm in the ground. The inscription on this stone cannot be read. There is a cross engraved within a circle at the top of the stone. The stone is upright and on a base. The inscription on this stone cannot be read. It is a 5 section stone that is otherwise in good condition. The stone is leaning slightly out of plumb. This is a small broken marker located at a very prominent earth mound. This is a small broken marker located at prominent earth mound. - There are two stones at this location. The one described above and a second marked "E H" which is probably the footstone. Both stones are lying on the ground with the footstone on top. Aged 3 yrs 7 mos. - This is a very white stone with an ornate shape and engraving, however, it cannot be read. The top is propped against a large base. There is a footstone lying nearby which is marked "B Mc G" which is should be with stone # 128. - This is a large upright stone that is in good condition and rests firmly upon its base. There is a crack through the center of the stone. The top of the stone is shaped like a pyramid and there is a cross engraved on the south side. - This is a large upright stone similar to # 128 with the pyramid shaped top. The stone is cracked through the middle and rests firmly upon its base. There is a cross engraved on the side with the letters "I H S" upon it. - The stone is leaning against the base but appears to be in good condition. There is a cross engraved within a circle at the top with the letters "I H S" upon it. - This is a large stone taht is in good condition and rests firmly upon its base. The top section of the stone apears to be missing. There are two footstones next to the monument with no apparent markings. This ia a ground marker set flush with the ground surface. The stone is in good condition. Footstone marked "E C H", "J P H"
The stone is leaning against a large tree and appears to be in fair condition. - The stone is in good condition and rests firmly upon its base. - The stone is broken in half with the bottom half still in the base. The top is propped against the bottom half. There is also a footstone (# 136) nearby. This is the footstone to stone # 135. It is in fair condition and is leaning against a tree. - The stone is in good condition and rests firmly upon its base. There is a footstone propped against it with no apparent markings. - The stone is in fair condition and is lying on the ground. - There should be a footstone nearby marked "R.H." which was recorded in the 1979 inventory. - The stone is in good condition and rests firmly upon its base. There is a cross engraved within a circle on side # 1. Footstone marked "M McN". This is probably the footstone for Miles McNally (see stone # 139). - The stone is in good condition and is leaning out of plumb. Footstone marked "T McN". This is probably the footstone for Thomas McNally (see stone # 139). This is a small marker leaning against a tree. The inscription cannot be read. This stone is in the ground but out of plumb. Footstone marked "J W". No photograph is available at this time. 8 and 1979 one being arranged alphabetically and the other appears to be arranged as you would walk through the cemetery. The inventories were then compared in order to determine if there were any discrepancies. I have also enclosed a copy of WCO Bill Bowers' latest book "Working in God's Wild Garden" to wish you both a Merry Christmas from the "Smoke-Eaters". The members of the Valley Smoke-Eaters Gun Club are very appreciative of your allowing us the enjoyment of hunting on your property and hope that you will enjoy Mr. Bowers' insight into some of the wonders of nature. For the cemetery project, it is my feeling that we should conduct a new complete inventory of the headstones so we can compare with those completed previously in order to determine the losses and damage that has occurred in recent years. I have also prepared a "Strategic Plan" for the cemetery restoration and inventory. As much as I dislike preparing them, it certainly does force you to establish goals and determine how to accomplish them. If you have any other goals you would like to include or have ideas as to how to better accomplish them please give me a call and I will include them. I'm sure that you will spend many hours during the coming winter months reading over the information included and hope that you find it as enthralling as I have. I would like to direct your attention to page 8 of "The Romance of Old Barclay" near the center of the page where Mr. Clarke quotes an article from the May 1, 1890 issue of the "Reporter-Journal" which states " Another drift is being opened toward Sand Run. We call it the Harkness Drift. Now business will be brisk again, we hope". It would be interesting to know where this mine was. I found that the first time I read "The Romance of Old Barclay" I was to excited to absorb much of the information and that it was necessary to read it several more times in order to comprehend that such a civilization once existed where today only the deer, bear, chickadees and the rest of nature flourish. With assistance from volunteers and possibly the Boys Scouts from the local area, all of the brush will be removed from the cemetery area and piled outside of the cemetery bounds in order to enhance the wildlife habitat of the area. Brush, logs and debris should be removed from the many subsidence hole in the cemetery to prevent future depressions after the holes area filled. Trash from the site will be collected and disposed of at an approved disposal site. Contact a local Boy Scout troop to see if they would be interested in helping with our project. The troop could possibly stay over night at the Smoke-Eaters cabin which could make it a two day project. To fill all subsidence holes and other depressions (except the former Catholic Church foundation) to provide a safe access to the general public. After removal of all brush and debris, the depressions should be inspected for any headstones that may have fallen into them. Fill could be acquired from the culm piles at the end of Cemetery road to fill in the depressions. This could be accomplished with the cooperation of Franklin Township after approval from the Pennsylvania Game Commission. A contact to Land Management Officer Chester Harris must be made prior to any excavation upon the game lands. A small backhoe will be necessary to transport the fill from the road into the cemetery. An access path should be delineated prior to entering the ground in order to prevent any damage to burial areas. To upright and repair all of the headstones that have fallen, been damaged, or broken. 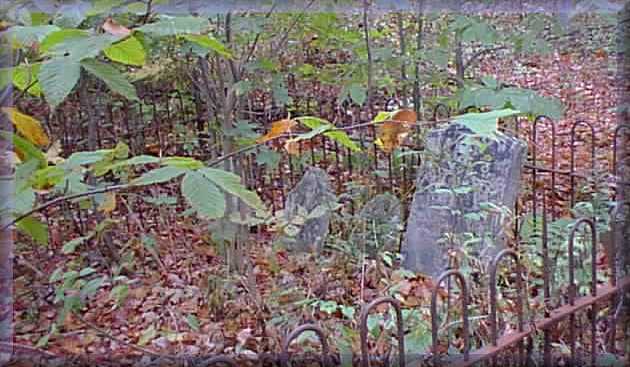 Analyze the site to determine the original location of each headstone. If necessary, dismantle the headstone (if it is constructed of several sections) and level the ground so that when the headstone is re-assembled it will be plumb and on a solid footing. If the original stone location is unknown, use the previous inventory to determine the approximate order of the stone location. If this does not help, look at the surrounding area to determine if an unmarked gravesite is nearby. If the stone is broken in half attempts shall be made to repair the stone using mortar or a suitable epoxy. All stone shall be inspected to insure that they are near to plumb. If need be they shall be excavated and re-set in their original position. To repair the remaining family plot fences. The area of the entrance gate shall be cleaned of any brush, leaves etc. in order to provide access to the gravesite. Broken fence could be repaired through welding or other means deemed adequate through a field inspection. To locate all of the headstones and family plots through an actual field survey and index the survey to an inventory of the stones. Locate all of the headstones through a field survey in order to permanently establish the location of each marker. The coordinates of each stone will be tied to permanent markers (iron pins) which will be set during the field survey. The stones will be indexed numerically to correspond with the inventory which will be conducted simultaneously. Prepare a map showing the numbered plots, fenced areas, roads, former church foundation and other features located within the cemetery area. Provide a copy of the map to the Bradford County Historical Society, Franklin Township Supervisors and possibly record with the Recorder of Deeds office. To conduct an inventory of the remaining stones in order to establish the names, dates, and full epitaphs on the stones. Number each stone and record the full name, date of birth, date of death, age, relation, and epitaph on each stone. If necessary, use chalk or other means to determine the inscription on the stone. Index the stones to the survey which shall be conducted simultaneously. To publicize the efforts being undertaken in order to promote interest in the cemetery and the history of "Old Barclay". Contact the Towanda Daily Review and the Sayre Evening Times to determine their interest in publishing articles about the history of Barclay and the cemetery project. It would seem that the Daily Review would be especially interested. Write an article to be published in the "Pennsylvania Magazine" which could be compiled from the 1928 article written by Stanley Clarke. To obtain funding for the restoration and preservation of the Barclay Cemetery. Contact the Pennsylvania Historical and Museum Commission about the possibility of applying for a grant for the restoration of the cemetery and possibly the erection of a historical marker in the Barclay village area. Solicit donations from the general public along with the articles that may appear in local newspapers and publications.